“It’d be fair to say that my dog has never been walked so much in her life.” This is what one reviewer of the new smartphone game Pokemon Go told The Guardian on Monday. And he’s not the only one. It appears that this new game craze has brought about a few unexpected benefits for dogs everywhere. For those of you who are still unsure what Pokemon Go is, here is a crash course. The Pokemon Go game is a smartphone app that can be downloaded for free to both Android and iOS systems. The basic premise of the game is to catch as many Pokemon as you can, similar to the older-style Pokemon games. Catching more Pokemon allows you to level up and battle your Pokemon at Gyms. The difference? Pokemon Go is played in the real world. In order to “catch ‘em all,” players actually have to walk around their neighborhoods to find Pokemon that are hidden in the real world. A small icon in the corner of the screen tells players when Pokemon are close by. When a Pokemon is found, the game accesses the smartphone’s camera and overlays a Pokemon onto a real-world image. In other words, it looks like the Pokemon is standing right in front of you, ready to be caught! For die-hard Pokemon fans, seeing Pokemon in real life is a dream come true. And for their dogs? All these walks through the neighborhood is the reality they’ve been waiting for. An article in DogTime discusses what it was like walking a dog while playing Pokemon Go. The author found that the game encourages them to walk more frequently and for longer periods, providing their dog with more exercise than normal. If you’re a dog owner with a high energy pup, this could be a great solution. It makes the walks that are already fun for a dog that much more fun for a dog owner. The premise of Wooftrax is that every time you walk your dog, money gets donated to an animal charity of your choice. The amount of money is based on how long you walk. The money comes from advertisers Wooftrax works with. So the longer and more frequently you walk, the more money gets donated! Don’t have a dog? No problem! You can still go for walks – while playing Pokemon Go or otherwise – and donate to your favorite animal organization. Wooftrax has the option to “Walk for Cassie” in place of owning your own dog. For those who are walking around and playing Pokemon Go, this is an easy way to donate to a great cause. No matter what kind of walk you take your dog on however, you must always remember to stay safe. It’s easy for Pokemon Go users to get lost in the world the app has created. As the game cautions, “Remember to be alert at all times. Stay aware of your surroundings.” This should be doubly true when walking a dog. Just as you would when you aren’t playing a game, stay aware of your dog’s behavior during a walk. And always look both ways before crossing the street! Don’t endanger your own life as well as your dog’s. Pokemon Go has the potential to be very beneficial, for both dogs and humans. And if you’re someone who has gotta catch ‘em all, have fun out there! Could This Newly Recognized AKC Breed be the Dog of Your Dreams? Could There Be Mold in Your Dog Food? Read About This Recall! 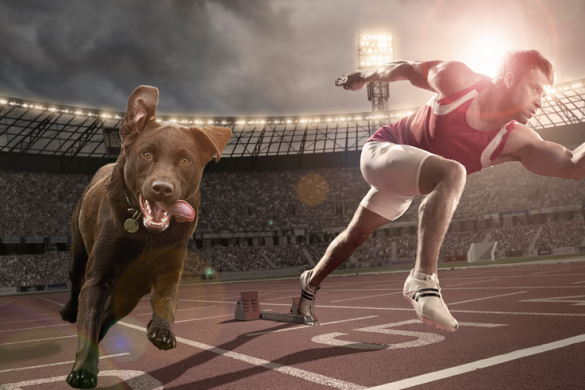 Are Dogs Faster Than Humans?